Ethernet connection using an Ethernet Module. The RS-232 connection from the computer running Fernhill SCADA to the RS-232 to RS-485 Adapter should include the TXD, RXD and RTS signals. The RS-232 to RS-485 adapter must be configured for 2-wire mode, where the transmitter is enabled by an active Request To Send (RTS) signal. Use Profibus cable (or equivalent) to connect the S7-200 PLC to the RS-485 Adapter. A standard Profibus connector simplifies the connection to the S7-200 PLC. 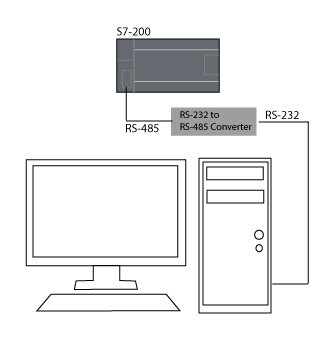 RS-485 adapters typically have four screw terminal connections often marked RX+, RX-, TX+, TX-. Connect the Profibus Red conductor to the RX+ and TX+ terminals, connect the Profibus Green conductor to the RX- and TX- terminals. Termination resistors should be used at both ends of the Profibus cable. For best reliability, the RS-232 port should be a direct peripheral port on the computer running Fernhill SCADA. Use of USB connected serial ports can introduce inter-character delays, which can result in communication dropouts. Use the Siemens S7 PPI Autodetect Wizard to automatically discover the correct communication parameters and configure Fernhill SCADA. The Mode settings of the Siemens S7 PPI Channel Tag should be configured to: Baud=9600 Parity=E Data=8 Stop=1 Rts=Tg. The Baud=9600 option matches the default baud rate of S7-200 PLCs. The Rts=Tg option tells the serial port hardware to make the RTS signal active during transmit. Create a Siemens S7 Serial PLC Tag that references the channel. 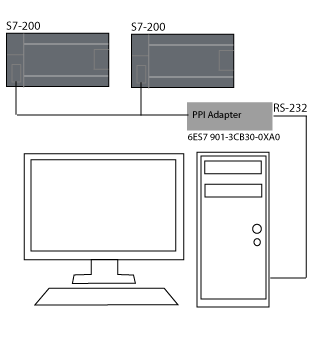 When connecting to a single S7-200 PLC, the PPI - RS485 connection of the PPI Adapter can be connected directly to the S7-200 PLC. When connecting more than one S7-200 PLC, use standard Profibus cable (or equivalent) to connect the PLCs together. Fit one Profibus connector with a programming port, and connect the PPI - RS485 connection of the PPI Adapter to that connector. There are 8 switches on the side of the 6ES7 901-3CB30-0XA0 adapter labelled SW1 to SW8. To work with Fernhill SCADA the switch settings need to be setup correctly. SW5 should be set to '0' (Freeport Mode). SW6 should be set to '0' (DCE Mode). SW7 should be set to '0' (11 Bit). There are 6 switches on the side of the 6ES7 901-3BF21-0XA0 adapter labelled SW1 to SW6. To work with Fernhill SCADA these switch settings need to be setup correctly. SW4 should be set to '0' (11 Bit Mode). SW5 should be set to '0' (DCE Mode). SW6 should be set to '0' (RTS on always). 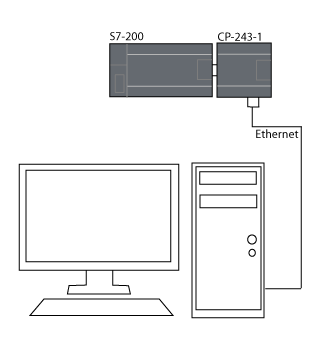 For a detailed overview of setting up an S7-200 Ethernet module refer to Siemens S7-200 Ethernet Connection Guide. If the S7-200 module is configured, you can use the Siemens S7 TCP Autodetect Wizard to try and locate the PLC on the network. For a step by step guide to configuring tags for Siemens S7 PPI connected PLCs. For how to configure an S7-200 Ethernet module and Fernhill SCADA to work together. For how to search COM ports for Siemens S7 PLCs and automatically create tags for any PLCs found.